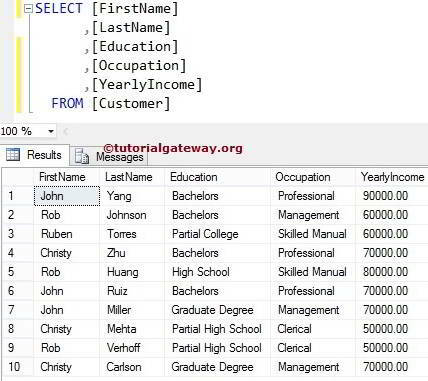 The SQL MIN Function is one of the Aggregate Function, which is used to find the Minimum value from the total records (or rows) selected by the SELECT Statement. The SQL Server MIN Function will ignore Null values. 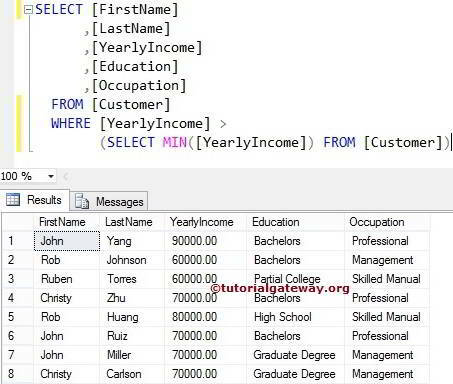 The Min function in SQL Server simply returns the Minimum value from the total records present in the specified column. For example, The following query will find the Minimum yearly income present in the [Yearly Income] column from Customers table. In most cases we usually check minimum product price (Lowest pricing product) belongs to particular category or color etc. 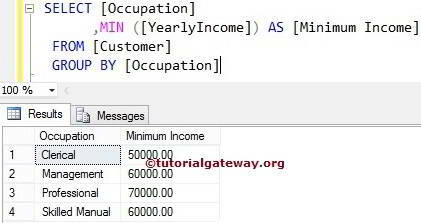 For example, The following sql server min function query will group the Customers by their Occupation and then finds the Minimum yearly Income present in each group. Below lines of code will check whether the aggregated amount (Minimum Yearly income of each individual Group) is greater than 50000 or not. If this is True then corresponding records will be displayed. When we are retrieving the data, In some cases we usually check for the conditions against the aggregated data. In these situations we have to use Suquery in SQL Where Clause. 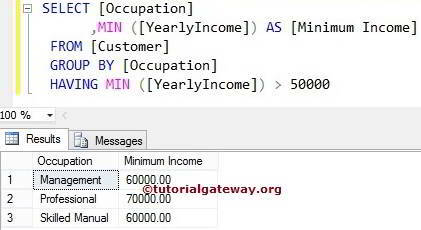 For example, The following Sql Server min function query will return all the Customers present in the customers table whose [Yearly Income] is greater than the Minimum yearly income.